London: Groombridge and Sons, 1852 318 pages, plus 160 hand colored plates. Beautifully rebound in dark red leather with ruled edges on covers. Gilt stamped lettering and three animal images on spine. Top edge of text block is gilded. Marbled end leaves. Covers show very light scratches on top cover and are otherwise Fine. First plate (jaguar) has been trimmed along the edge, though not affecting image. First leaves are a little soiled and smudged, and there appears old smoke stains along top edges of these leaves. Scattered, light offsetting from plates. 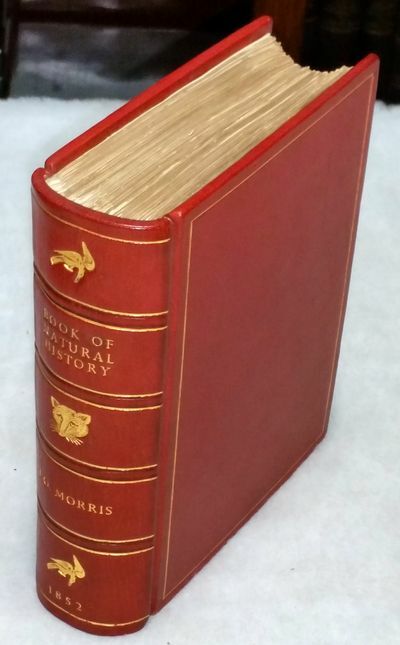 Overall a tight, complete, and fairly clean copy in a truly stunning binding. . First Edition. Full Leather. Good+/No Jacket.